Welcome to Pagliacco Turning and Milling, manufacturer of wood columns, porch posts, balusters, newels, corbels and fine custom woodwork. Pagliacco (pronounced 'poly-ahko') Turning and Milling is your source for wood columns, Turncraft fiberglass columns, Royal Corinthian columns and balusters, wood porch posts, Turncraft PVC posts, wood balusters and newels, railings, corbels and more. Choose from our standard patterns or give us a custom order—we guarantee high quality materials and craftsmanship. Our products add beauty and value to buildings of all styles from Victorian homes to Greek Revival to post-modern classics. Most of our corbel and bracket jobs are custom. Though we have some standard patterns usually we alter them to fit your needs. As time goes on, we regularly add new patterns to our standard list. Our patterns are there to help you design your project, but in no way are you limited to them. We produce custom woodwork and we provide custom service, too. When you call us, you will speak to knowledgeable professionals with years of experience in architectural woodturning and millwork. Every order is important to us and we take pride in the quality of our materials and craftsmanship. 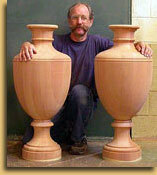 We at Pagliacco have worked with the people at Turncraft for 25 years. We offer the complete line of Turncraft products at discount prices. Our products include custom woodturning of balusters, solid porch woodturning posts, newels, straight and curved railings, classic and custom woodturning columns and capitals, brackets, spandrels, and table legs. Pagliacco combines design authenticity, the highest quality materials. More on why you should choose Pagliacco for your Architectural Wood Products needs.